the turn of the 20th century, which included Happy Hooligan (a jobless scavenger), Mr. Jack (a cheating, philandering lowlife) and The Katzenjammer Kids (spectacularly misbehaving ethnic slum children), was widely deplored by the genteel and well-bred. It was very unusual for him to drop a feature for no reason other than being vulgar. But that's what happened to A. Piker Clerk, which briefly ran in Hearst's Chicago American. Mr. Clerk's claim to vulgarity was his gambling habit. Each day — his strip was probably the first reliable daily — he'd bet on a horse in a Chicago race. Next day, the race run, the strip would open with him having won or lost, depending on how the real-life horse did, then it was on to the next bet. 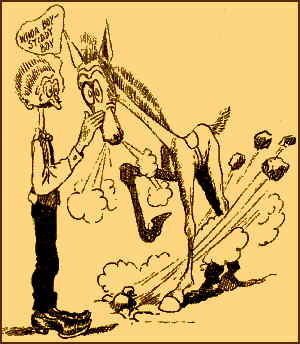 The character and his gimmick were created by cartoonist Clare Briggs, who is much better known for a later creation, the domestic comedy Mr. & Mrs. Briggs did it at the behest of editor Moses Koenigsberg, who thought a racing-related comic, running in the sports pages, would appeal to adult readers of the daily papers. Many sources give 1904 as the year A. Piker Clerk began, but The San Francisco Academy of Comic Art has a couple of strips from December, 1903 in its collection. The above description may sound familiar to those who know a little about comics history, in particular the history of the long-running Mutt & Jeff — right down to the part about being the first daily strip (Mutt & Jeff was the first successful daily). Even physical descriptions of the protagonists sound alike. Mutt (Jeff came later) and Clerk were both skinny, mustachioed, long-nosed and chinless. But if Bud Fisher, Mutt's creator, did get the idea from Briggs, that's okay. Hearst pulled the plug on A. Piker Clerk in June of 1904, so by 1907, when A. Mutt began, it was long out of use. So it was Mutt & Jeff that inspired the daily comic as a newspaper staple. Clare Briggs moved on to When a Feller Needs a Friend, Danny Dreamer and a host of other comics — leaving A. Piker Clerk, which could have been a major history maker, a mere footnote. Text ©2005-10 Donald D. Markstein. Art is in the public domain. This image has been modified. Modified version © Donald D. Markstein.